Giles Goddard, famous for overseeing the development of the highly regarded N64 title 1080 Snowboarding, has recently confirmed that his Vitei team is working on a new WiiWare game that makes use of the new Balance Board peripheral. Goddard, who started out at legendary UK developer Argonaut before being poached by Nintendo of Japan, has a wealth of industry experience under his belt after working on many high-ranking internal Nintendo projects. Our current game uses the Balance Board actually, and it’s due out in September on WiiWare. So yes, much like Theta (Japan-only DS title) we came up with several prototypes of games and picked one that we thought was the most uniquely suited to the interface. The interesting thing is that the games you would think would work well with the Balance Board actually don't. So it should be interesting to see what kind of stuff gets made for it. The full interview will be posted on Cubed3 shortly. Given the pedigree of the developer, this has the potential to be very interesting indeed! Cool. Coming from them, there are a lot of possibilities of this being good. Cool I will get this if its good (And if I can manage to get my hands on the Balance Board). Could be cool but I hope that you can play it w/out the board too as I have no reason to get Wii Fit. "The interesting thing is that the games you would think would work well with the Balance Board actually don't." Funny thing is, the only games I think would work are things like skateboarding, snowboarding, surfing, and balance exercises like Yoga or Tai Chi. So is he saying this game doesn't work? Because it seems like a perfect fit. This actually seems like a wii-ware game worth buying! (: Just hope that Nintendo sorted the storage issue! 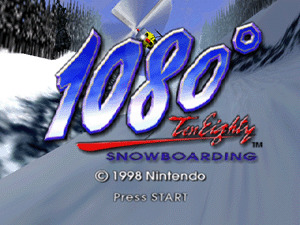 I don't think I've played the N64 1080º, though I have played 2 snowboarding games before, one on the playstation that wasn't very good, and another one that was pretty good, though I don't remember exactly what game it was, maybe it was a 1080º, as I recall that name from somewhere. And if this one is a snowboarding game, then it's another reason for me to buy Wii Fit(I've been putting it off until I can buy it with my own money), along with that new Tetris game and the new Skate, if it's using the balance board(I never played original, but I saw someone playing it at a car show, and it looked awesome!). Giles Godard is a very important person in Nintendo-land. From memory he was working for argonaut games and deveoped a 3d engine for the NES called starglider. Nintendo had no idea about how to "do" 3D so they grabbed argonaut to show them with Starfox (remember that? ), Stunt Race FX and some others. I trust him with the balance board. he did all that? Now I don't care what that game is, 'cause if he can do all that, then this has got to be cool!